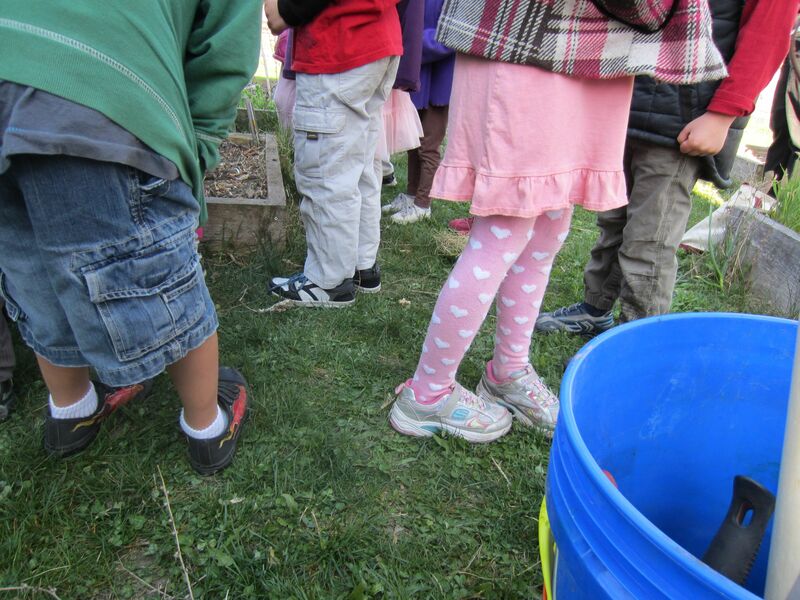 It has been so inspiring to see so many gardening programs popping up in schools and summer programs across the country this spring. Last year, before I really had begun to dig into the gardening scene, I felt like I might have been on the fringe of something big as I started to volunteer for a middle school gardening program. Now, as I have the amazing opportunity to research teaching gardens as part of my Masters program in Nutrition, I am amazed to see how much research is being committed to understanding and evaluating these programs! Just this past week, the program “LA Sprouts” was highlighted in the Journal of the Academy of Nutrition and Dietetics. The study assessed some markers related to better eating habits, such as preferences for fruits and vegetables or changes in beliefs about cooking and ability to prepare fruit and vegetable foods at home. The study was conducted among fourth- and fifth-graders in a Latino community, who indeed reported an increased preference for vegetables as a result of the 12-week program. Researchers have argued that an increased preference for vegetables can suggest an increased likelihood that children will consume vegetables, but this can’t be taken as definitive proof that kids are definitely eating more of these foods. An interesting finding from a previous paper about LA sprouts, however, was that this same program resulted in a slower amount of weight gain in overweight children than those in a control group, so there is some promise for these programs to either improve what kids eat or get them to be more active. For all the nutrition-minded science geeks out there who want to understand the health benefits of community and school gardens: it isn’t just about the fruits and vegetables. I started this blog just a few months ago as a way to track my experiences spending time in the land of community gardening. As a graduate student in nutrition research, I’m a big fan of learning about any programming designed to encourage better eating habits or better food environments – particularly when it involves increasing fruit and vegetable consumption. So what have been the hot topics? 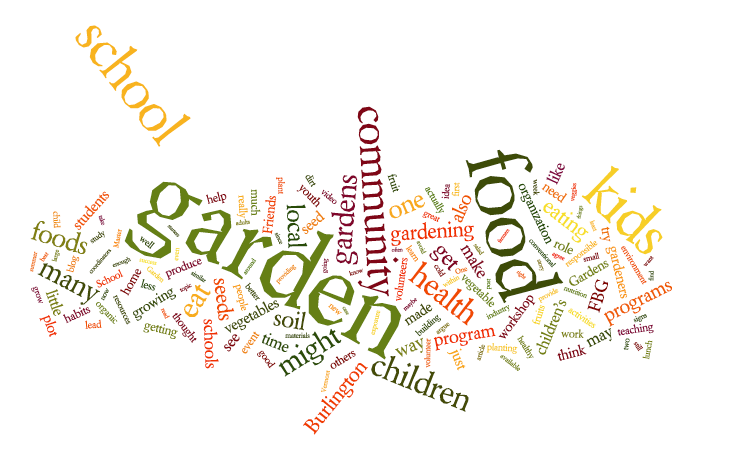 The words garden, kids, school, and food have come up a lot, as has the word community. However, being nutrition-minded, it’s interesting to note some words that are not as prominent as they could have been: fruit, vegetable, produce, nutrition… Here and there while writing this blog, I have touched upon the importance of getting kids to eat more fruits and vegetables, such as when I shared this very entertaining video that models vegetable consumption, as well as the functionality of home versus community gardens in getting adults to eat more fruits and vegetables. However, you may have realized – like I have – that the health benefits of gardening are greater than simply providing fresh fruits and vegetables. One of the words that has been most important and repetitive in this blog is community. In my time spent with the local organization Friends of Burlington Gardens, I have learned that garden programming is not only largely supported by volunteers… but that the volunteers also become those who benefit from the program. Consider how the stakeholders affecting our larger food environment may clash: the food industry’s interest in what foods we purchase is largely driven by profit and sustaining business by selling more product, while parents’ interests are at least partially driven by what they deem healthy for their children. Put simply, parents’ and industry’s interests don’t always align. For instance, consider the impact of food marketing on your food choices. Even I have ranted before about how packaging and familiar spokes characters could influence what kids eat – for better or worse (‘Cap’n Carrots’ anyone?). However, what I take away from my blog’s emphasis on community is that, when we work on a smaller scale within our own communities, the number of stakeholders decreases. Consequently, there will likely be less conflicting interests, and so these smaller food systems can be a win-win for everyone. In the case of the small-scale garden programs within a single town like Burlington, each volunteer hour or seed sown can be a direct benefit recycled back to that same community. If anyone out there is compiling a list of the top ten best pun-laden gardening songs, this video should top the list. Songwriter Michael McConkey runs a really SWEET fruit nursery in Afton, VA, called Edible Landscaping. Listen carefully to catch these fun and quirky lyrics… I know they leave me artichoked-up in my heart...! I had posted before about media that models healthy behaviors – such as promoting vegetable consumption – and I don’t think Michael’s song was as consciously designed to influence children’s (or adults’) behaviors, but I have watched this video so many times trying to get down all of the great puns that I wonder if it might make me crave some certain fruits and veggies. Endive anyone? Share your favorite pun here! Look Kids…Vegetables are Cool! Just Give ‘Em a Try! As the rates of childhood obesity in the U.S. rise, nutrition and public health experts continue to advocate that children increase their fruit and vegetable consumption in place of those calorie-dense junk foods. Garden programs, as well as other programs targeted at kids, often have this same goal, but the hardest step may be getting over that first hump: getting a child to just at least TRY a taste of the new food. Indeed, researchers have shown that children are more likely to eat a food if they are repeatedly exposed to it through repeated taste tests. So, while we grow lots of spinach and kale and carrots in the garden, how do we get kids to try that first bite? One way we can do this is by modeling the behavior. Social Learning Theory, a theory frequently adopted in school interventions that promote fruit and veggie consumption, is based on the idea that we learn behaviors by watching how others act in situations. (A great read on this theory in this book.) So, for instance, if I see someone eating a bowl of brussel sprouts on a few occasions, I will absorb this information and imagine myself eating brussel sprouts. What’s more, if I see someone eating brussel sprouts AND enjoying eating those sprouts, I am more inclined to imagine and believe that I too will enjoy eating brussel sprouts, if I’m ever in a similar situation where I’m offered that food. 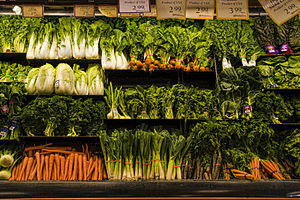 So, how can we effectively model eating vegetables? I found an excellent example on Youtube! In Eric Herman‘s music video, he shows that even those who are hesitant to eat vegetables might learn to love them once they try them. The video starts with Eric skeptically taking a bite out of a carrot, surprised to find he enjoys it. He repeats this with a green bean “cause my mother said I should [eat green beans],” and then a beet, showing that not only will someone like carrots once they try the food, but that trying carrots may lead to trying other vegetables which that person will also turn out to like. The more Eric tries of different vegetables, the more “crazy over vegetables” he becomes, and this extreme appetite for vegetables is portrayed as adventuresome, goofy, and absolutely fun. At the same time, the character is portrayed as a cool dude himself after eating his vegetables – rocking out on his guitar while coasting in a grocery cart – which suggests others might also become super-hip as a result of trying vegetables. Does the music video actually work?? The real test would be to check in with the young children who watch this video and see if it results in any changes in behavior. In comparison to many of the corny (yes, pun intended) videos out there that encourage kids to eat fruits and vegetables, this rock video is much more modern. I want to be like Eric after watching this video because he is so entertaining. So, if Social Learning Theory really works, I think this is the kind of video that would actually catch kids’ attention and deliver an effective message. Anyone have vegetable-phobic kids at home who could test the video? We want kids to optimize their health by eating fresh produce from the garden, but should we be concerned about microscopic germs creeping in the soil? During my most recent visit with the Friends of Burlington Gardens, the director met with Phil*, a representative from a well-known and respected nonprofit. Phil is in the process of planning a fundraising event where as many as three-thousand people would be asked to each plant an individual flower or vegetable seed in their provided container. For this big event, Phil plans to collect donations of seeds and soil and provide a unique growing container. With the supplies mostly lined up, he visited Friends of Burlington Gardens to ask for help with the logistics of actually getting three-thousand people to sow their seeds in their containers. Similar to a previous seed-starting event I posted about earlier, Phil is looking for help to direct children and adults on how to plant their seeds at soil stations set up at the event. One of Phil’s logistical concerns was sanitation. How would three-thousand people wash their hands after getting muddied up from the soil? Besides a little dirt under the fingernails, Phil commented that his co-workers – less comfortable with gardening and getting down in the dirt – had been concerned about how hygienic or sanitary this might be and wondered how they might be able to set up hand-washing stations in the park where the event was to be held. Dirty soil. I had not thought much about this before. It is true that soil is loaded with microbes – some more friendly than others – so how concerned should this event be with providing water and soap to the participants after they plant the seed starters? Phil added that he was less concerned about the sanitation issue himself, so really he was bringing this up more on the behalf of his co-workers, but the Friends of Burlington Gardens director supported his idea. Hand washing stations make sense for such a large crowd. Plus, they could be used to rinse out the planting containers as well. I agree with Phil and the director that hand washing stations would be appreciated simply because this will be such a large event. But it got me thinking about the response Phil’s co-workers had to gardening and the less obvious matter they may have been expressing… In the grand scheme of things, how concerned should we be about children’s health and sanitation when playing in the dirt? So for those who might be less comfortable with a little dirt under the fingernails, are there ways we should try to make the gardening experience more hygienic and ‘clean’? 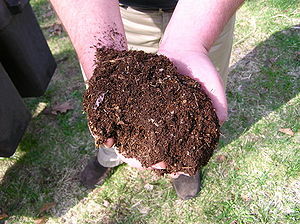 Or do you think getting dirty and grubby is a necessary rite of passage for the gardener? I would love your thoughts on this, as well as suggestions for a more hygienic dirtiness!